Saint Justina who was from Damascus, lived in virginity for the sake of Christ. Saint Cyprian, who was from Antioch, began as an initiate of magic and worshipper of the demons. 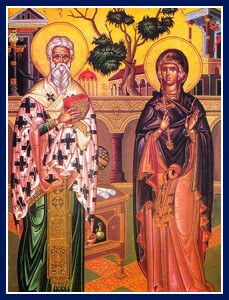 A certain foolish young man who had been smitten with Justina’s beauty hired Cyprian to draw her to love him; when Cyprian had wed every demonic device he knew, and had failed, being repulsed by the power of Christ Whom Justina invoked, he understood the weakness of the demons and came to know the truth. Delivered from demonic delusion, he came to Christ and burned all his books of magic, was baptized, and later ascended the episcopal throne in his country. Later, he and Justina were arrested by the Count of Damascus, and having endured many torments at his hands, they were sent finally to Diocletian in Nicomedia, where they were beheaded about the year 304.